Thank you so much for all your sweet and kind wishes on my pregnancy yesterday. I really appreciate it. Naturally there will be a few baby related posts here on hei Astrid in the future, but it won't turn into a baby/mommy blog. I will still post about all the other things I care about too - like food. I enjoyed doing The Dinner Project a lot. After I stopped doing it I kind of lost focus on dinners, especially after I got pregnant. I feel like I have hardly cooked at all, and if I've made anything I've made hot dogs - with ice cream for dessert. A huge hit for this pregnant lady. At one point I'll be inspired to get into the kitchen again. I hope. By the way, The Dinner Project book is still available in my Blurb book store. PS: I have made a new blogroll for pregnancy, baby, kids, motherhood and family related blogs and websites. You find it in the sidebar to the left. Hope you're having a wonderful day, dear A! oh congratz!! how exciting! I can't wait to see more of your dinners! 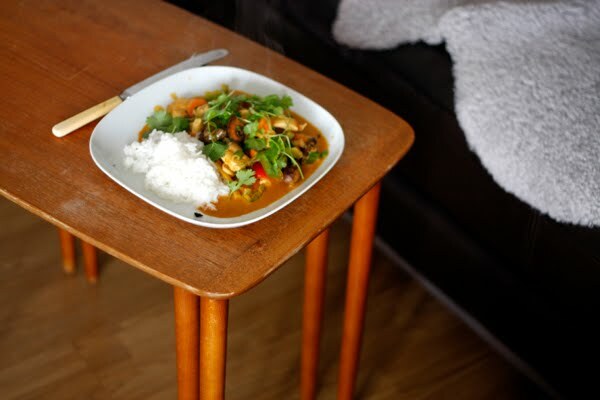 I might have to try making that curry, looks too delish!! Astrid, can you tell us how to pronounce 'pyttipanna'? How exciting!! Congrats on the pregnancy! Also, I'm soooo glad you'll keep writing about other things too, like food!! I love hearing about what you eat. Å, hekkan, mor! Gratulerer så mye til dere begge! Så utrolig koselig! Håper formen er fin! Hils Sølve masse og spør såklart når terminen er. Heheh! I missed your last post. Congratulations on the pregnancy! How exciting! Btw I really loved your dinner project. Can't wait to see your future work!